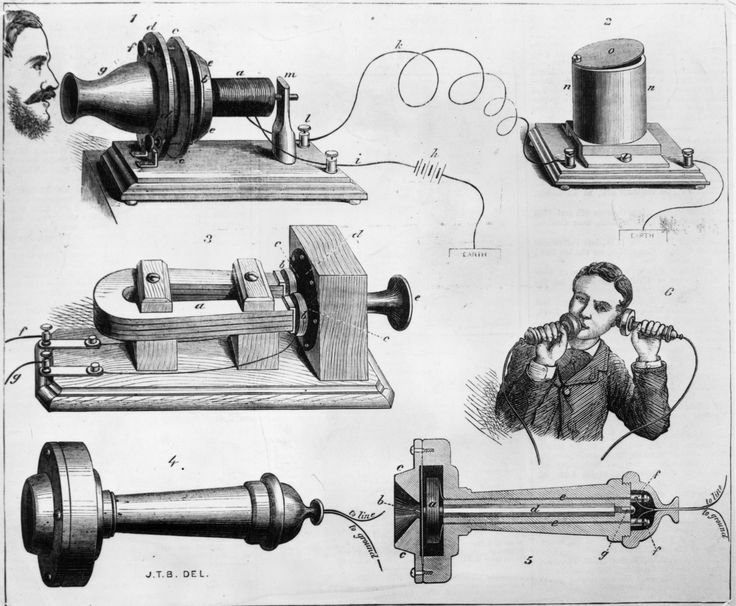 Diagram of Alexander Graham Bell's Telephone, 1877. Courtesy of the Universal History Archive/Getty Images. Image available on the Internet and included in accordance with Title 17 U.S.C. Section 107. Fairfax Exchange Building that housed the Southwestern Bell capitol main office on Preston in Houston, circa 1926. Courtesy of the City of Houston. Image available on the Internet and included in accordance with Title 17 U.S.C. Section 107. Southwestern Bell Central Office with operators working the switchboard, circa 1918. Courtesy of the AT&T Archives and History Center and the City of Houston. Image available on the Internet and included in accordance with Title 17 U.S.C. Section 107. TELEPHONE SERVICE. At the Philadelphia Centennial Exposition in 1876 one of the visitors, Col. A. H. Belo from Texas, became interested in an exhibit by Alexander Graham Bell of his new invention-the telephone. Belo, publisher of the Galveston News and later founder of the Dallas Morning News, determined to have one of the new instruments as soon as possible, and on March 18, 1878, he had a line installed between his newspaper office and his Galveston home. This telephone, according to some sources, was the first installed in Texas and one of the first 1,000 telephones installed nationwide. Subsequent demand for telephones by other Galvestonians led to the construction and installation of a switchboard to switch calls from one line to another. The first Texas telephone exchange opened for business on August 21, 1879, and soon afterward another was established in Houston. According to other sources, which cite a San Antonio Daily Express article of June 11, 1893, it was George Washington Brackenridge of San Antonio who installed the first telephone. In the article Brackenridge is quoted as saying, "I cannot give the exact date of the establishment of the line, but it was about twenty years ago." If it had been exactly twenty years previously, or 1873, that date would have been three years prior to the date officially designated for the invention of the telephone by Alexander Graham Bell. From Brackenridge's statements it is obvious that he was using a printed message system on his first line rather than a talking system; it is also possible that he was using a talking system by 1877, although the evidence of a much later reminiscence is not conclusive. The first exchanges were built by the Western Union Telegraph Company under patents awarded to Thomas A. Edison. According to present standards, early switchboards were quite crude. Calls were made by battery signals operated by push buttons, and almost all lines were party lines. The first type of magneto signal bells were long narrow boxes from which a large button projected in front. By striking the button with the hand almost hard enough to crack the plaster on the wall, a current from the magnet inside signaled the operator in the central office. Southwest Telegraph and Telephone Company Office, Fort Worth, 1881. Courtesy of the Portal to Texas History. Image available on the Internet and included in accordance with Title 17 U.S.C. Section 107. Male Switchboard Operators, circa 1877. Image available on the Internet and included in accordance with Title 17 U.S.C. Section 107. The Southwestern Telegraph and Telephone Company, organized in 1881 to operate exchanges in Arkansas and Texas, took over the Galveston and Houston exchanges and started exchanges at Austin and San Antonio. A Dallas exchange with forty subscribers opened on June 1, 1881, and a Fort Worth exchange opened on September 1 of the same year with about the same number of subscribers. The Waco exchange opened with forty-five subscribers on October 1, and during 1882 exchanges were opened in Brownsville, Brenham, Cleburne, Colorado, Corsicana, Gainesville, Greenville, Jefferson, Marshall, Paris, Palestine, Sherman, Denison, and Texarkana. The next step in development for the new Texas industry, connecting individual exchanges by long distance lines to allow people in one town to talk with those in other towns, was completed in 1883 with construction of the state's first long distance line linking Galveston and Houston. In the spring of 1883 eastern capitalists purchased Southwestern Telegraph and Telephone, changed the company's name to the Erie Telegraph and Telephone Company, and established temporary headquarters in Little Rock, Arkansas. On July 19, 1883, general offices were established at Austin. A little more than a month later there were 2,344 subscribers statewide: Galveston, the largest exchange, had 330 subscribers; San Antonio, 323; Dallas, 259; Fort Worth, 168; and Houston, 148. The following year, in an effort to improve unreliable service, the company established a precedent when it introduced women as operators during night hours at Galveston. Boys had initially been used as operators, but their rude remarks to customers and their erratic operating practices were a trial to telephone users. The practice of using women as operators was soon established in all exchanges. PBX Board Operator. Image available on the Internet and included in accordance with Title 17 U.S.C. Section 107. While sources disagree, it is generally accepted that the first PBX board (private branch exchange switchboard) in the United States was installed in the Capitol Hotel, later renamed the Rice, in Houston in 1882. The first common battery switchboard, where telephones operated from energy supplied by centrally-located batteries instead of individual batteries at each telephone, was installed in Dallas on February 13, 1899, when the Dallas exchange had 1,200 subscribers. After 1900 telephone systems in Texas continued to grow as equipment improved, long distance lines were extended, and more telephones were added. On April 30, 1906, the telephone company reported 102,443 telephones statewide. The first automatic telephone exchange in Texas, built at Cleburne in 1903, was operated by the Cleburne Automatic Telephone Company. This exchange ceased operation on July 19, 1912, when a fire destroyed much of the equipment. The first dial exchange of the Southwestern Bell Telephone Company was installed in Dallas on July 30, 1921, and when the Wichita Falls exchange was changed to automatic operation on December 10, 1921, it was the first city to have all dial telephones. Southwestern Bell Telephone Company Logo. Image available on the Internet and included in accordance with Title 17 U.S.C. Section 107. Southwestern Bell Telephone Company Direct Distance Dialing Operating Room. Image available on the Internet and included in accordance with Title 17 U.S.C. Section 107. On March 1, 1912, the Missouri and Kansas Telephone Company, the Missouri Bell Telephone Company, the Pioneer Telephone Company of Oklahoma, and the Southwestern Telegraph and Telephone Company were consolidated to form a new operating unit known as the Southwestern Bell Telephone Company, with headquarters in St. Louis. By the end of 1946 this firm operated more than 930,000 telephones in 247 exchanges, while 349 other Texas telephone companies with 794 exchanges operated a total of 182,704 telephones. The largest telephone centers, all Southwestern Bell exchanges, were Houston, with 169,068 telephones; Dallas, 147,497; San Antonio, 85,323; Fort Worth, 73,566; and Austin, 34,030. Southwestern Bell had 20,000 employees in Texas at the beginning of 1947 and handled an average of 7,165,000 local and 130,000 long distance calls every day. 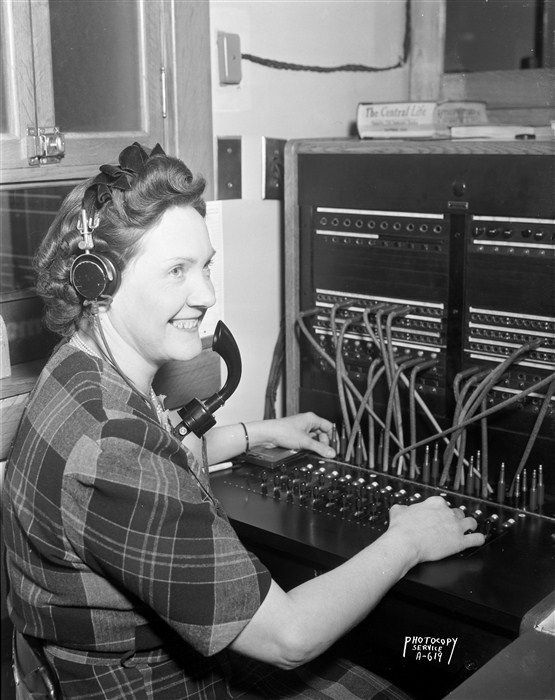 Telephone service in Texas increased rapidly after World War II. By 1955 there were 311 telephone companies operating 2,398,521 telephones statewide, and Texas ranked seventh in the nation in number of telephones (all figures here include main line telephones and do not include extension telephones). On May 7, 1955, the state's two-millionth telephone was installed in the governor's office at Austin. Southwestern Bell Telephone Company inaugurated direct distance dialing in Harlingen in 1955, and by 1963 Texas had more than 550,000 telephones on direct distance dialing networks. 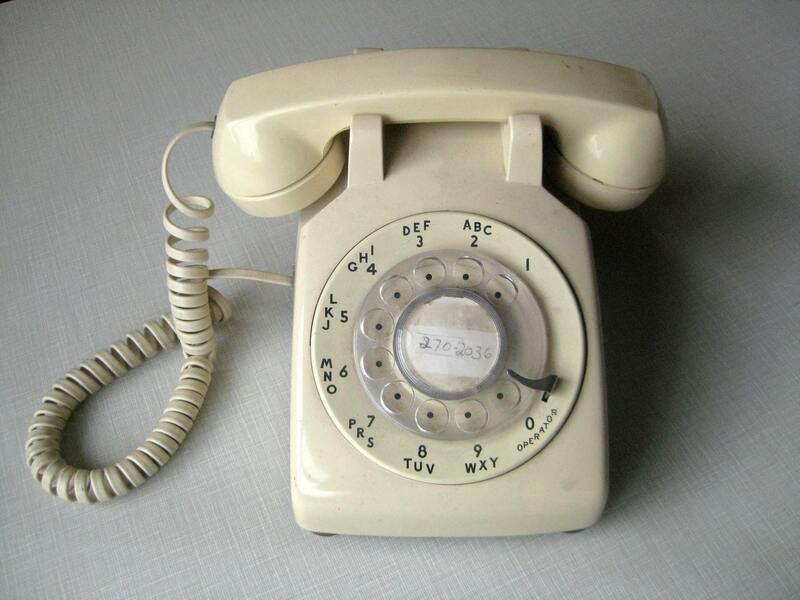 1960s Rotary Dial Bell System Telephone. Image available on the Internet and included in accordance with Title 17 U.S.C. Section 107. As telephone systems were consolidated, the Texas industry grew from 6,266,000 telephones operated by 108 companies on January 1, 1971, to 7,058,993 telephones served by ninety-eight companies on December 31, 1972. In that year Texans served by Southwestern Bell Telephone Company, the largest company in the state, made a daily average of 35,221,822 local and long distance calls. The city of Houston, with 1,369,069 telephones, had the largest number of any metropolitan area in Texas. By January 1, 1975, there were 7,747,100 telephones in the state, more than 90 percent of which were on direct distance dialing. Of the ninety-six companies then in operation, ninety were members of the Texas Telephone Association, including Southwestern Bell Telephone Company and Mountain Bell Telephone Company in El Paso County. By 1980 Texas telephones had increased to more than eleven million, served by eighty local exchange companies. Southwestern Bell Telephone Company averaged more than 71,500,000 local and long distance calls daily. With 298 exchanges serving almost nine million telephones, the company employed 50,337 workers with an annual payroll of almost $1.75 billion. Another Bell System company, Mountain Bell, operated six exchanges in El Paso County with 280,711 telephones. Major independent telephone companies in Texas included General Telephone Company of the Southwest, San Angelo (1,363,714 telephones); Continental Telephone Company of Texas, Dallas (179,765 telephones); Central Telephone Company of Texas, Killeen (126,550 telephones); Gulf States-United Telephone Company, Tyler (131,789 telephones). Among the seventy-eight independent telephone companies in the state were twenty-three telephone cooperatives owned by subscribers, serving more than 105,000 telephones through 217 exchanges statewide. Bell System companies continued to serve four out of five telephones in the state, while independent companies served over half the state's 250,000 square miles of certified service territory. Telephone lines along a Texas dirt road. Courtesy of the Portal to Texas History. Image available on the Internet and included in accordance with Title 17 U.S.C. Section 107. AT&T Logo. Courtesy of Union Plus. Image available on the Internet and included in accordance with Title 17 U.S.C. Section 107. Southwestern Bell Corporation became a separate entity when the Bell System divested in 1984 and was thenceforth no longer associated with AT&T. The largest subsidiary of the new company was the Southwestern Bell Telephone Company, which provided service to nine million customers in five states, including Texas. Also established in 1984, the Texas Division of Southwestern Bell Telephone, with headquarters at Dallas, became one of the largest nongovernmental employers in the state, serving 6.2 million customers in 549 Texas communities. Southwestern Bell handled more than 75 million local calls and provided access for five million direct-dialed long distance calls daily. In 1990 Texas had almost nine million telephone lines, served by fifty-eight local exchange companies, which also provided roughly one-third of the state's intrastate long distance service. AT&T and 154 competitive carriers provided most intrastate and all interstate long distance service. The Texas Division of Southwestern Bell Telephone served more than 6.9 million customers in 530 Texas communities, and employed 30,558 workers. Southwestern Bell handled more than 87 million local calls and provided access for an additional six million direct-dialed long distance calls daily. The company served the state with more than one million miles of copper and fiber optic cable. Total plant investment of the industry in the state was over $18.5 billion, and industry-wide employees numbering 37,690 received almost $1.4 billion annually. Telephone companies paid state and local taxes of $535 million and federal income taxes of $316 million. By 1990 major independent telephone companies in Texas included GTE Southwest (1,204,791 lines), Contel of Texas (167,801 lines), Central Telephone Company of Texas (127,393 lines), United Telephone Company of Texas (110,750 lines), and Lufkin-Conroe Telephone Exchange (63,717 lines). Because customers now owned the wiring within their premises as well as inside equipment, the industry no longer counted total telephones served. Access lines reflected the number of connections provided by the company, but did not equate to number of customers. Fifty-eight independent telephone companies in the state included twenty-four telephone cooperatives serving more than 100,850 access lines through 204 exchanges, while Bell System companies served roughly 80 percent of all Texans. A plaque commemorating the first Texas telephone exchange is located on the corner of Rosenberg and Sealy streets in Galveston in the AT&T central office. Handbook of Texas Online, Frank Whitten and Diana J. Kleiner, "TELEPHONE SERVICE," accessed April 20, 2019, http://www.tshaonline.org/handbook/online/articles/egt02. Uploaded on June 15, 2010. Modified on July 12, 2017. Published by the Texas State Historical Association.